At Witchfest last month I spent a bit of time chatting to the lovely people who create the Astro Moon Diary and looking at their diary and calendar for 2015. 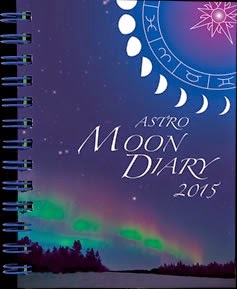 I’ve always liked the Astro Moon Diary and it seems to get better and better each year. The new one is really lovely with colour artwork and loads of information about astrology, astronomy and pagan seasonal festivals. As well as being packed with lunar and astrological information for the year, inspiring images and things like seasonal recipes, the Astro Moon Diary 2015 is slightly smaller in size than previous editions, which makes it much easier to fit in a pocket or bag. I think that's very practical. 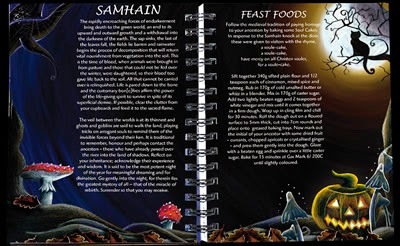 Another thing pagans will like is that the diary starts from the Winter Solstice rather than starting on January 1. It runs right through to December 31, 2015, giving you a few useful extra days of diary to write in. 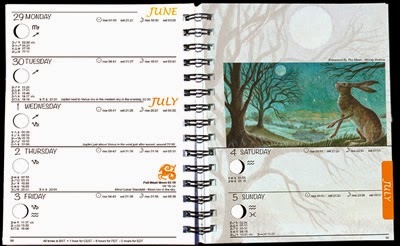 Tina Smale, one of the partners in the small UK-run pagan business Astrocal, told me that they really try to make the diary better and better each year. It is intended to be suitable for those just interested in the Moon and her cycle as well as professional astrologers. 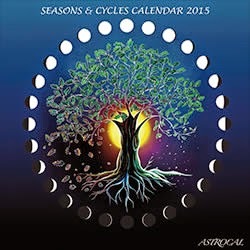 Astrocal also has a brand new wall calendar out for 2015. Called the Seasons and Cycles Calendar, it celebrates nature’s seasonal cycle and the eight fire festivals. The calendar has gorgeous colourful illustrations which I love. Each picture shows seasonal landscape with the plants, flowers and fruit that you might see that month. To the left of each picture is an oak tree portrayed in its natural cycle from bare branches to buds then green leaves, which turn gold in the autumn and return to bare branches over a snowy landscape for winter. This calendar is designed to take you on a journey through the seasons of the year showing the Moon's daily phase, eclipses, fire festivals and when to look out for meteor showers and planets in the night sky. I've got a copy for my own wall and know it will inspire me throughout the year ahead. One of the other products that Astrocal sells is a silver moon phase poster. It is intended to help you keep in tune with the Moon's phase at a glance. It shows all the Moon's phases for 2015 and includes the times for each full and new Moon and highlights the beauty of the Moon's cycle as she waxes and wanes throughout each month. At the bottom of the poster, is a lovely illustration of the Cove at Avebury. As well as being suitable for anyone interested in the Moon's cycle, it is an ideal thing to give as a low-cost gift for Yule.